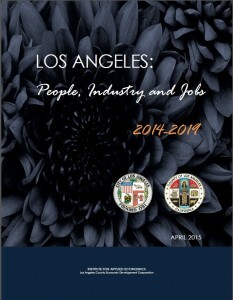 The LAEDC’s Institute for Applied Economics has published a new study on LA County’s workforce needs, occupational forecasts, and skills required by occupations, to provide workforce development intelligence as part of our ongoing partnership with our regional Workforce Investment Boards (WIBs) and other education and workforce development partners. The study, titled People, Industry, and Jobs is available to any interested readers below. Both the City of Los Angeles and Los Angeles County are detailed.